God gave us a great turnout! Thanks so much for praying for our CMDA Winter Conference! God really blessed our weekend. In this update, I want to give you an inside look at the weekend through some “statistics”, pictures and snapshots of what God did. 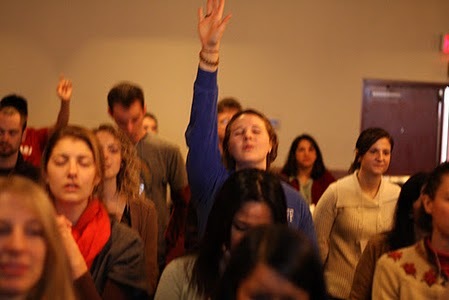 One of our group worship times. Mere numbers can never capture the relationships they represent, but these quick “stats” may give you a unique perspective on my experience at the conference. Although Winter Conference takes place on a larger scale, in many ways it’s also about the many individual and small group interactions that God provides. This is where some of the most intense ministry takes place, often unnoticed. Here are snapshots of some of my favorite times at the conference. 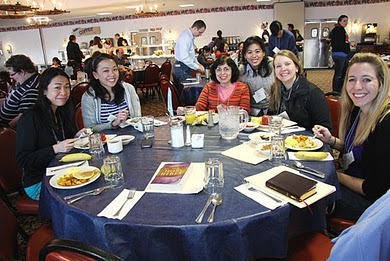 The Penn students from this year's conference. Throughout the weekend, I enjoyed sharing a room with three of the Penn guys. After I agreed to help the Penn ladies pull a prank on them, I was discovered and wound up being pranked myself, with my reaction unwittingly captured on video! These are the kind of rare opportunities to connect and have fun together that only happen at conferences like these. It was a joy watching two of our local council members, Drs. Charlene Brock and Jerry Hric, make it down for the conference. Like everyone on our council, they have such a heart for investing in the students, and it’s exciting to invest in God’s work as a team. God gave me lots of great conversations with students from Philly. One shared about a new dating relationship he had just begun and ways in which God was helping him re-engage spiritually and relationally. In between sessions, a leader asked if we could talk about the lower turnout from his school, and what we could do to strengthen involvement at his campus. Another leader mentioned that her campus had significant involvement from first-year students, but that as of yet none seemed ready to lead for next year. I was thankful for the chance to encourage these students and learn about important campus dynamics that I can follow-up on now that we’re back in the city. As the song mentions, the conference was a sort of “mountaintop” for many of us, a vantage point from which we could see all that God has done, particularly as we look back on where we were just one year ago. One student, “Mark”, was wrestling through what it meant to be a leader during last year’s conference. God blessed us with an important conversation then that He used (in part) to help Mark take important new steps of faith and courage that transformed him and the ministry on his campus. It was incredibly gratifying to watch Mark – without any prompting on my part – take initiative in advance of this year’s conference to gather the Philly area folks there for a spring ministry planning meeting. Even better, his vision is to provide direction while enlisting others to step up so the conference can be self-sustaining from year-to-year. While God gets the credit, I’m thankful to have played – and continue to play – a role in Mark’s development as a leader who is beginning to develop other leaders. 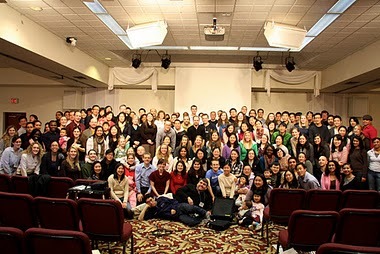 This is how the Kingdom multiplies! There’s so much more I could share, but I hope this view from the ‘mountaintop’ gives you a taste for what God did. Thank you for making weekends like this one possible through your faithful partnership with us. To God be the glory! PS – A special thanks to Jefferson student Sharon Li for permission to use her (fantastic) pictures!